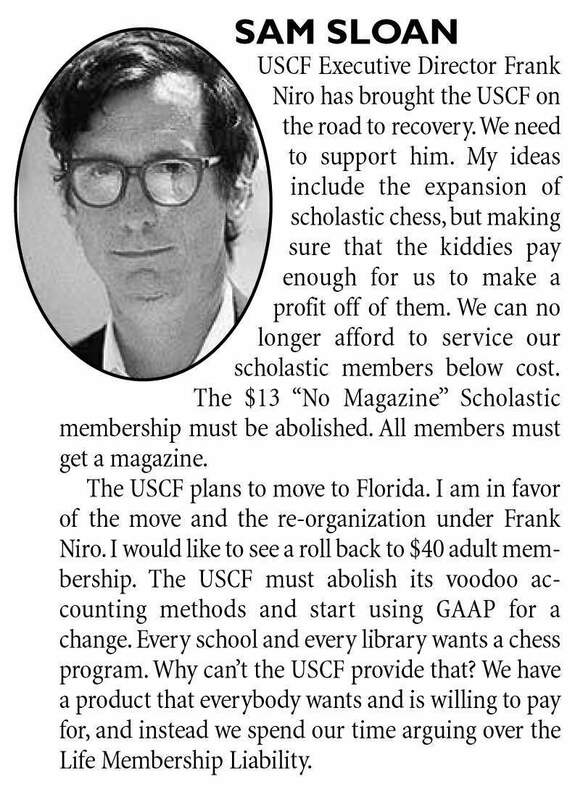 In my report of the USCF Executive Board meeting which was held on March 15-16, 2003, I forgot to mention one important development. At the meeting, USCF President John McCrary said that, in making arrangements for the recently concluded US Championship, no provision had been announced for the breaking of ties. As it turned out, there was one clear winner but seven players had tied for second. FIDE has agreed that five US players will be seeded into the next 128-player knock-out World Chess Championship (if another one is ever held, but that subject was not brought up). As a result, it would be necessary to break the ties, because four of the seven would go directly to the world championship. The other three will go to a continental championship which, President McCrary hoped, might be held in the USA. The problem was that no tie-breaking system had been announced in advance. However, Carol Jarecki had discovered that no matter which of the major tie breaking systems was used, the same four players would come out on top. The only alternative would be a play-off. However, Executive Director Frank Niro pointed out that the players would expect to be paid for the play-off, and there was no money available to pay them. All of the seven tied players came from the North East, the furthest away being Illinois and Kentucky, so geography would not be a major problem. A vote was taken. By unanimous vote of 6-0, it was decided that a tie-breaking system would be used, with Arnold Denker not present at the meeting. After the vote was taken, it was announced who the winners were on tie-breaks. This result had not been announced earlier, in order that there not be politics as a factor in this issue. Tom Brownscombe then announced the winners: Kaidanov, Gulko, Stripunsky and Benjamin were the top four, leaving out Ivanov, Golden and Fedorowicz. It seems a bit unfair that 19-year-old Akobian, who risked all by going all out to try to defeat Shabalov in the last round, thereby winning the US Championship, and achieved a winning position but then lost, will not be allowed to compete for the World Chess Championship, whereas players who took quick draws in the last round will get in. PS Tired of listening to this music? I have changed from Blue Danube to Blue Moon.